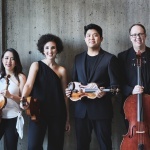 On May 10 the Verona Quartet, hailed by The New York Times as an “outstanding ensemble,” dedicated to showcasing the art form of the string quartet and to elevating their music making to convey the poetic narrative of storytelling will be performing at “the cell.” The Quartet’s members represent four different nations (USA, UK, Singapore and Canada), but their singular approach and unanimity of purpose in both musical and cultural cooperation has quickly earned the group a reputation for its interpretive strength… robust characterization [and] commanding resonance. The Verona Quartet, including Dorothy Ro/Violin, Abigail Rojansky/Cello, Jonathan Ong/Violin and Jonathan Dormant/Cello, has established itself as one of the most sought after string quartets of its generation, delighting audiences at venues worldwide including Wigmore Hall (London, UK), Izumi Hall (Osaka, Japan), the National Theatre (Abu Dhabi, UAE), Melbourne Recital Hall (Melbourne, Australia), and, in New York City, at Weill Recital Hall at Carnegie Hall and Alice Tully Hall at Lincoln Center. 2018-2019 season highlights include performances on the Lincoln Center Great Performers Series, Buffalo Chamber Music Society, Boston Celebrity Series, Lunenburg Academy of Musical Performance, Jordan Hall and Strathmore’s Music in the Mansion. The cell is located at 338 West 23rd Street in the Chelsea section of Manhattan.